Some of you may know Buffer as a social media management tool – others recognize it as the company that made the salaries of its entire company public in an effort to provide full transparency for both its team and customers. Since Buffer made its salary formula public two years ago, it’s also made other internal information accessible, such as team diversity, real-time revenue, valuation and term sheet. Today, it’s going back to where it started by reshuffling its salary formula to account for cost of living inflations. Under the new formula, employees are eligible for up to $8,000 on top of their annual salary to adjust for market rates where they are locally based. In addition to the new formula, Buffer also released a calculator tool that helps estimate your salary at Buffer based on your location, job title, skill level and family size. For example, If I were a blogger at Buffer, continued living in New York City but remain unmarried with kids, I’d be looking at about $86K a year. Here’s hoping more companies will take after Buffer’s openness and support their employees in a way that’s fair and reasonable. 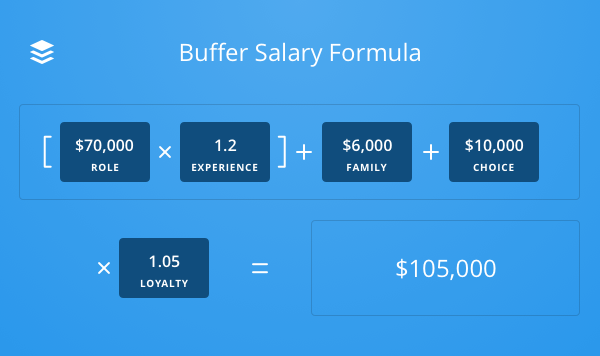 For more information on Buffer’s open salary formula, you can check out the full blog post here.